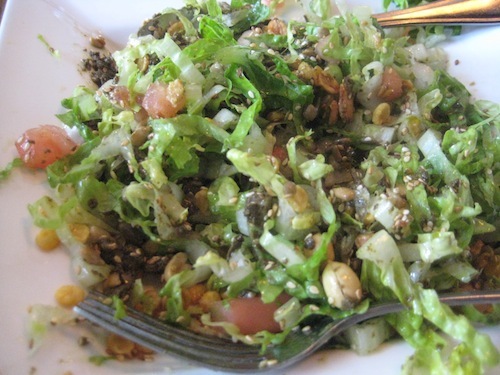 Burmese Surprise: Tea Leaf Salad is a Dessert! I find myself irresistibly attracted to trying new cuisines because it broadens my world-view as well my palate. This first struck me on a trip to Tokyo, when I woke up to the fact that Japanese breakfast tables had not a sweet item in sight. Eventually, I became rather fond of the soup, fish, rice and odoriferous fermented soybeans. For my latest cultural exploration, I recently joined the many fans of Burma Superstar in Oakland and began my introduction to Burmese cuisine by enjoying one of the country’s most popular dishes: Tea Leaf Salad. 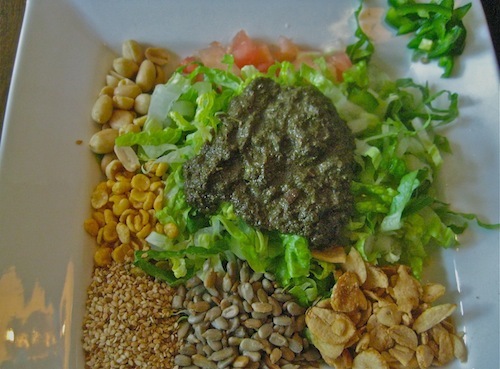 Its ingredients — fried garlic and chickpeas, peanuts, sesame seeds, sunflower seeds, slivers of hot green pepper, chopped lettuce and tomato, crowned by a dollop of pungent fermented tea leaf paste — come humbly arrayed in separate piles on a plate, like a palette of oil pigments which have not yet been combined to make a masterpiece. The server adds a generous squeeze of lemon juice on the verdant heap of tea leaves and tosses the salad, combining the separate elements into a synergistic symphony of flavors. Each mouthful of the salad is slightly novel and deeply satisfying as the mixture of textures is united by the musky fermented tea leaf ooze. In a quest to learn more about Burmese cuisine, I dig up the classic cookbook, Under the Golden Pagoda: the Best of Burmese cooking by Aung Aung Taik. Taik is an artist who grew up in Burma “spoiled” by a mother who was a wonderful cook. When he moved to America, he was inspired to prepare traditional Burmese dishes not only for himself but to educate the palates of Americans. In case you are not familiar with it, Burmese cuisine is influenced by its neighbors, Thailand, China, Laos and India, but maintains a distinctive set of flavors and preparation techniques. Burmese meals are served on low tables. Diners sit on mats on the floor. There are no courses. Rice, the mainstay of the diet, and all the other dishes are placed on the table at one time. Diners eat most foods with their hands, using the fingertips of the right hand to form the rice into small balls that they dip into the curries and other dishes. Chopsticks and spoons are also used for salads and soups. On my first visit to Burma Superstar, I also ordered their Samusa soup. The bowl was an amusement park of flavors, featuring a rich assertive broth full of shredded cabbage, falafel and dough pockets filled with spicy potatoes and vegetables. Because of the way in which this recipe is prepared, we call it a salad, but it is actually a dessert and always eaten after a meal. 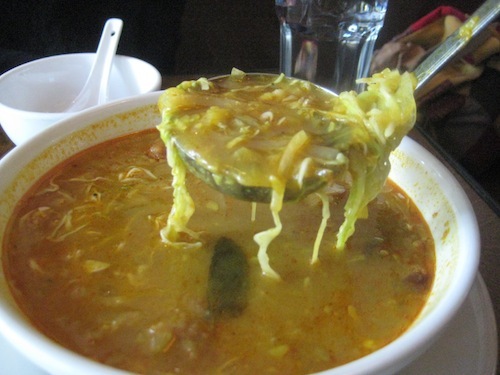 Burmese restaurants in San Francisco offer it as a first course because their non-Burmese patrons would find it a very uncommon dessert, but such a practice would be taboo in Burma. Today, on my second visit to Burma Superstar — just for fun — I ask for the pumpkin chicken and pea spouts first and then finish the meal with the tea leaf salad. It totally works. 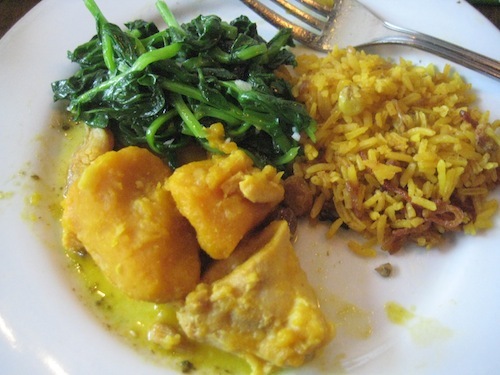 Have you had a cultural food experience that rocked your assumptions? This entry was posted in Burmese cuisine, gluten-free food and tagged Aung Aung Taik, Burma Superstar, Burmese cuisine, eat with your hands, Laphet, samusa soup, Tea Leaf salad, Under the Golden Pagoda. Bookmark the permalink. 3 Responses to Burmese Surprise: Tea Leaf Salad is a Dessert! Anna, thanks for reminding me I’m overdue for a meal at Burma Superstar. Had forgotten about the delicious interplay among the different elements in that Tea Leaf Salad, until I saw your photos, that is. The platha is pretty addictive too. I haven’t tried the platha/bread yet but I saw plenty of other patrons enjoying it. Ahh, a good reason to go back for another meal. Finally got to eat at Burma Superstar. WOW! Keep finding these gems! We ordered all of the above mentioned foods and have plenty for a repeat tonight!